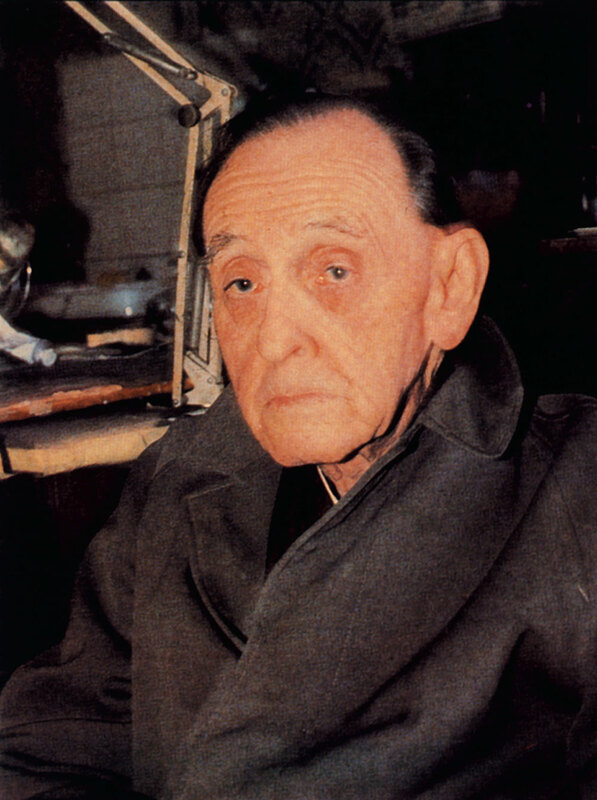 Fred Page is best-known for his eerie images which, according to one critic, have made him known as ‘a kind of Hitchcock among painters’.1 Page always used a limited colour range in his work, mostly employing either tempera or acrylic. The artist often claimed that he limited his palette to black and white because of his dire financial circumstances. Page’s early life was unsettled. He lost his mother when he was ten, and was passed from relative to relative, even spending some time in an orphanage in Dundee. As an adult Page moved from one job to another, and spent some time in the military. He first arrived in Port Elizabeth, the city with which his art is now synonymous, to work in a tyre factory in 1937. When war was declared in 1939 he rejoined the military, serving in the Signal Corps. It was only after the end of the war in 1945 that he decided to become an artist. He first started a correspondence course, but then a grant awarded to him as an ex-serviceman allowed him to enrol part-time at the Port Elizabeth School of Art, where he studied under Jack Heath from 1946 to 1947. With Heath’s encouragement and the growth of technical confidence and discipline, he began exhibiting his work with the Eastern Province Society of Arts and Crafts from 1948. He held his first solo exhibition in 1960, followed by many others. This small work by Page in the Campbell Smith Collection (plate 98) is painted in gouache on paper, and dates from the year of his first solo exhibition. It is remarkable within Page’s oeuvré for the high proportion of yellow ochre used in the foreground. The heightened mood suggested by this use of colour, as well as the long shadows thrown by the trees, recalls the comparisons often drawn between Page’s work and that of the Italian metaphysical painter, Giorgio de Chirico (1888–1978). The bleak, harshly-lit landscape with its row of low-economic houses, however, is not of the old colonial quarter of Port Elizabeth, but suggests a ‘township’ in a semi-rural area. The black, leafless state of the trees, on which hang tattered rags, as well as the random scattering of white stones on the ground, indicate that some violent cataclysmic event has just passed. Painted in 1960, it seems possible that Page painted this small picture in response to the Sharpeville riots of that year. If so, this is one of the more overtly political paintings by an introverted white artist who seems on the visual evidence of his work to have been wholly apolitical. Nicholas Slabbert, ‘The logic of darkness’, Standpunte, 118, p. 17. Melanie Hillebrand, ‘Fred Page’, Our Art, 4, (ed. Riena van Graan). Foundation for Education, Science and Technology: Pretoria, p. 45. Born Utrecht, Kwazulu-Natal, 1908; died,/b>, Port Elizabeth, 1984. Training 1944: Art course by correspondence. 1945-1947: Part-time studies at Port Elizabeth Technical College under Jack Heath (1915-1969). Exhibitions 1948 onwards: Group Exhibitions in South Africa, mostly with the Eastern Province Society of Arts, as well as in Germany, the United Kingdom and Greece. 1960: First solo exhibition, Port Elizabeth. 1965: Grosvenor Gallery, London. 1968: Durban Art Gallery: Artists of the Eastern Province. 1975: Retrospective exhibition, King George VI Art Gallery (now the Nelson Mandela Metropolitan Art Museum, Port Elizabeth). Collections Hester Rupert Art Museum, Graaff-Reinet; Nelson Mandela Metropolitan Art Museum, Port Elizabeth; Pretoria Art Museum; William Humphreys Art Gallery, Kimberley; Iziko South African National Gallery, Cape Town. Fred Page photographed in 1981. Source: Melanie Hillebrand. 1993. ‘Fred Page’. Our Art/Ons Kuns 4. Foundation for Education, Science and Technology: Pretoria. p. 42. Photographer: Joan Fourie, Dean of the Faculty of Art and Design, Port Elizabeth Technikon.